This series is a response to one reader’s request (It’s nice to know I have at least one reader!) They’re grab bags of trip suggestions and photos from many sea kayak voyages I’ve made through BC’s Gulf Islands over the course of more than two decades. 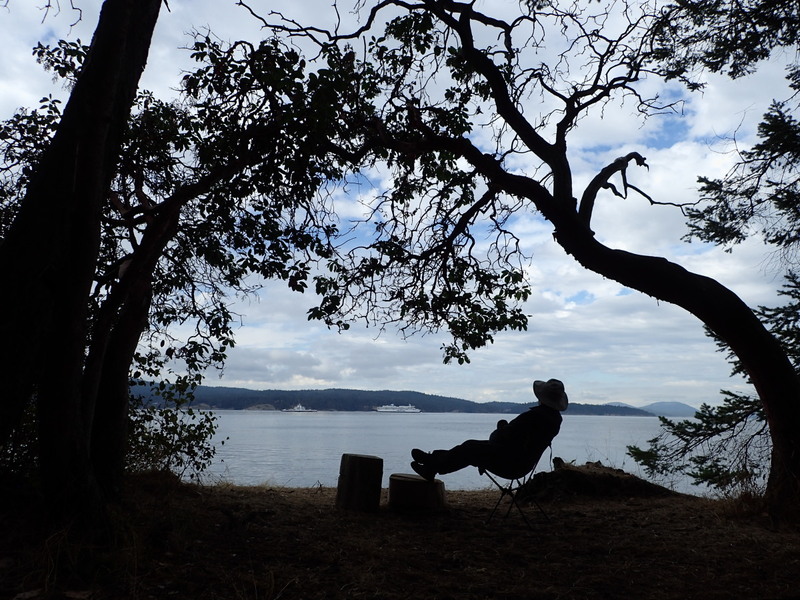 I keep going back, not just because of the islands’ proximity to my home port of Vancouver, but also because they are richly served by a combination of National, Provincial and commercial water-accessible campgrounds. * By mixing up routes and seasons, you can create an infinite variety of voyages. One piece of gear that will really open up your trip options is a set of take-apart kayak wheels. 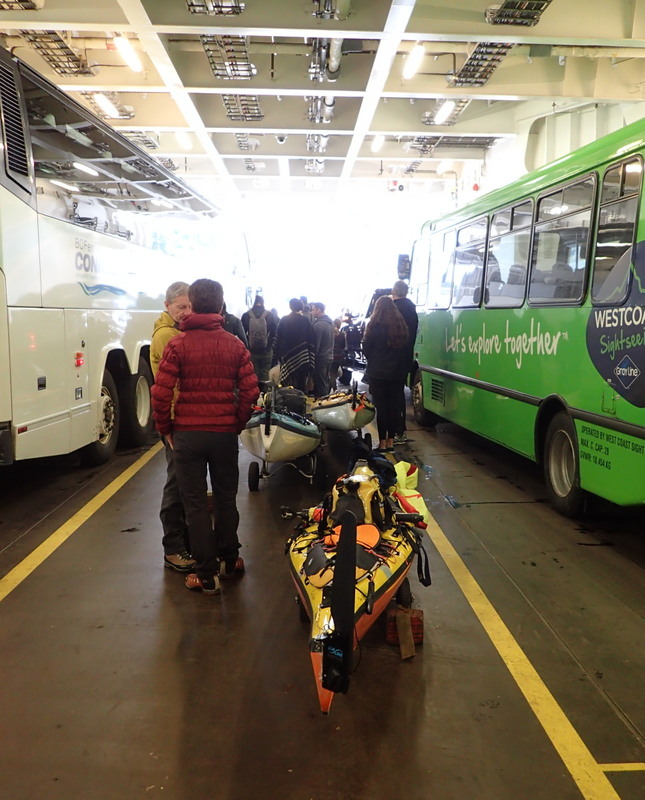 With these, you can park your car at one of the main BC ferries ports (Tsawwassen if you’re coming from the BC mainland, Swartz Bay if you’re on Vancouver Island), then simply wheel your kayak aboard the ferry as a foot passenger. 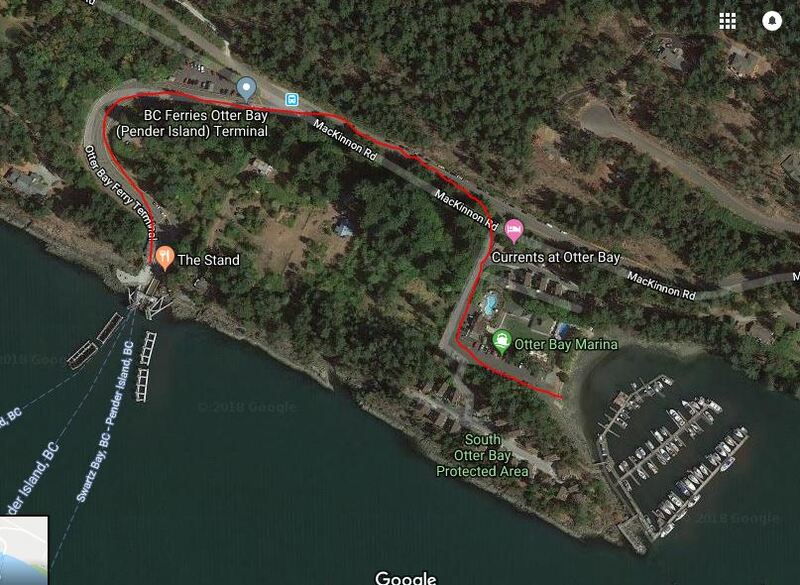 Not only does this ensure you make your sailing even if the ferry is full to cars, it lets you do “open gate” trips, where you don’t need to paddle back to the BC ferries port you put in from. 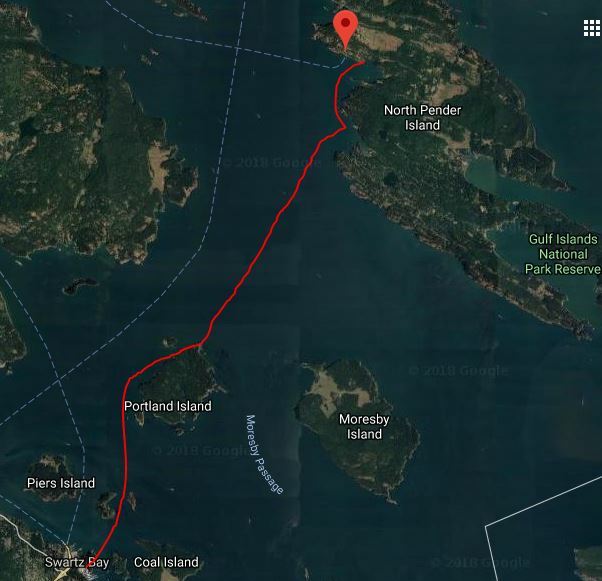 For example, you could wheel on board a ferry at Tsawwassen, take the ferry to Swartz Bay on Vancouver Island, paddle over and camp on Portland Island, then paddle to Village Bay on Mayne Island, where you can catch a ferry back to Tsawwassen. 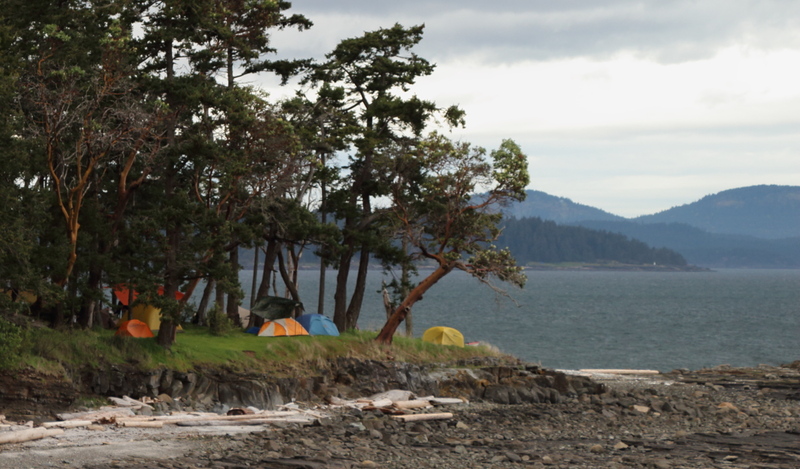 Portland Island, AKA Princess Margaret Island, is a great place for your first kayak camping outing. 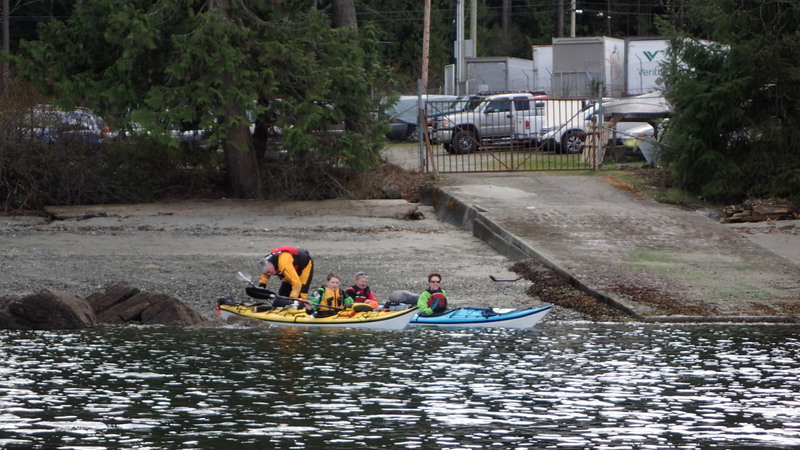 The Shell Beach and Princess Bay campsites are only about an hour’s paddle from Swartz Bay. 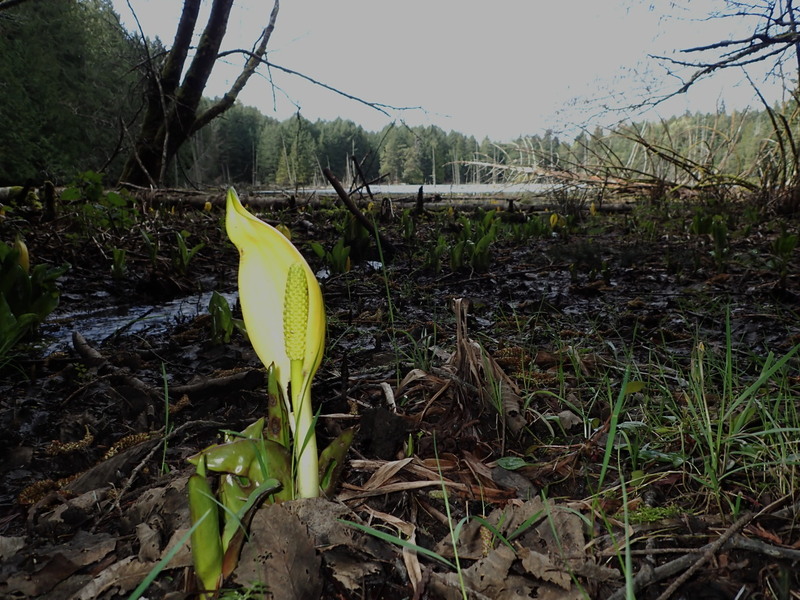 The entire island is part of the Gulf Islands National Park Reserve, so there are no private homes. Or roads. Or cars. Instead, there is a hiking trail running around the entire perimeter of the island. Arbutus Point has wonderful views through more than 180 degrees. On the mainland, Washington State’s Cascade Mountains, including Mount Baker, sprawl majestically. This is the point of camping, really. 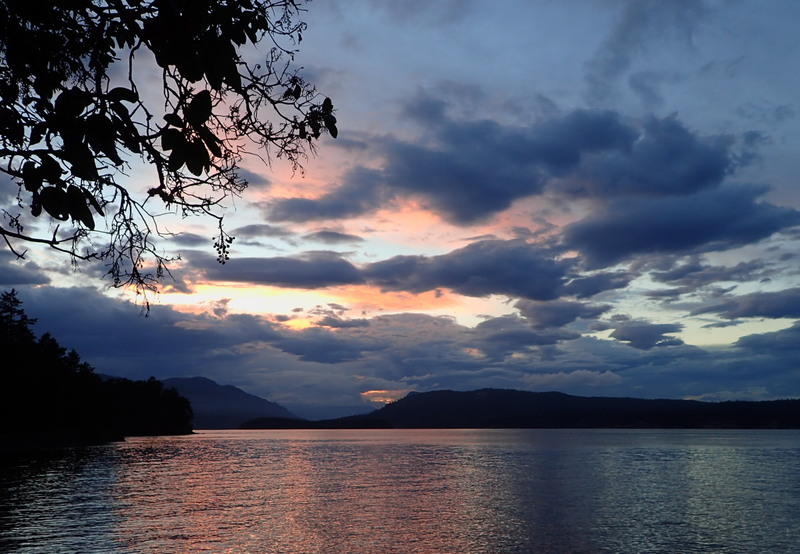 The view towards towards Vancouver Island provides spectacular sunsets. 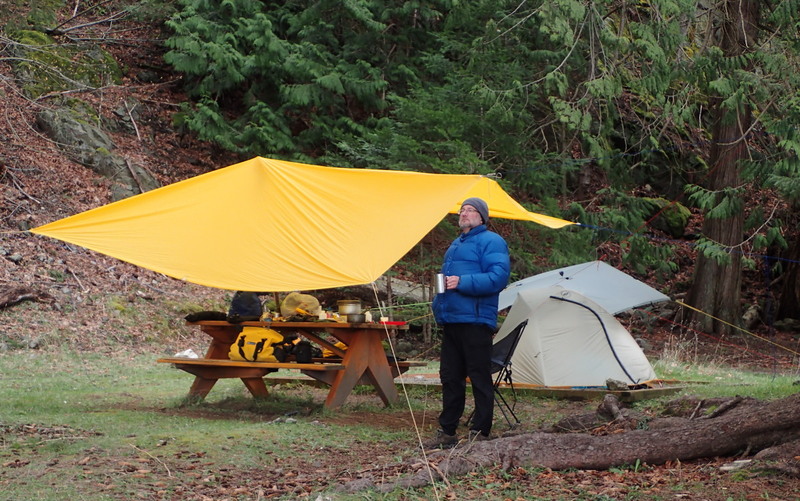 The campground at Shingle Bay on North Pender island is not as sprawling or pretty as Portland Island, but it does offer very sheltered landing and launching, plus easy access to the Roe Lake Trail. Though it runs very near housing developments, the trail is cunningly routed to avoid urban sights and sounds, so it retains a quiet, pastoral feel. 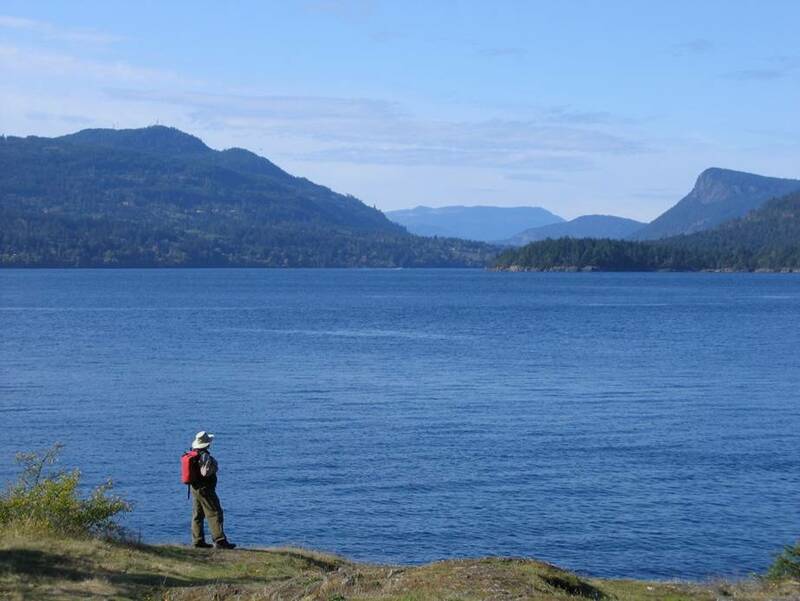 * The best, and most up-to-date, resource for water-accessible campgrounds here, or anywhere else on the BC coast, is the map on the BC Marine Trails website. You can use the map for free, but why not join the BCMTN? For $25 a year, you’ll not only turn off the auto-beg pop-up, you’ll be supporting a very worthwhile organization. This entry was posted in BC, BC Marine Trails, BC Marine Trails Network, BCMTN, British Columbia, British Columbia sea kayaking, Gulf Islands National Park, kayak camping, kayak touring, sea kayak and tagged Arbutus Point, BC Ferries, British Columbia, Camping, expedition kayaking, Gulf Islands, Gulf Islands National Park Reserve, kayak camping, kayak touring, North Pender Island, Otter Bay, Pacific Northwest, Portland Island, Princess Bay, Princess Margaret Island, Sea Kayaking, Shell Beach, Shingle Bay, Swartz Bay by Philip Torrens. Bookmark the permalink. 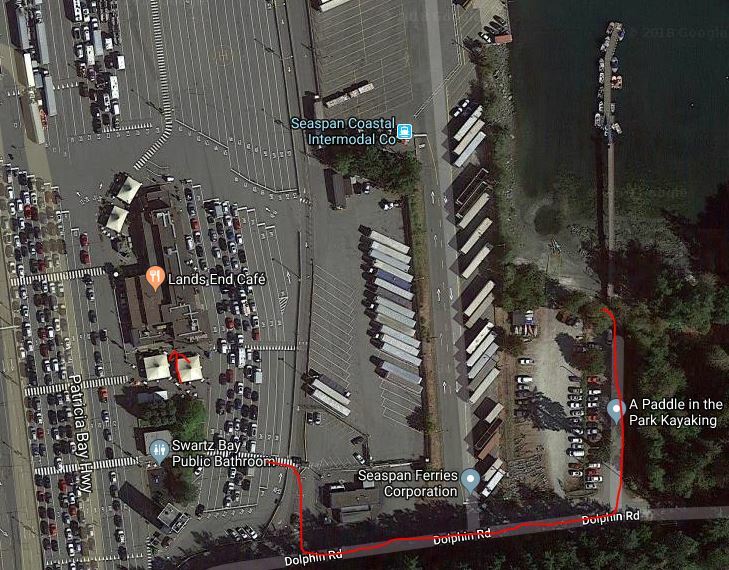 At Swartz Bay, I find it very convenient to wheel down the ramp from the pier to the dock – and launch from the dock: It’s all down hill, so the cart wheels itself and the dock is a nice clean staging area to get all set up before starting. Depending on preference, one can slide the kayak off the dock or maneuver the kayak and cart perpendicular to the dock edge and just slide the kayak off the cart. So that’s another option if the bank down to the beach is too difficult to maneuver. Thanks for another great article.